Uogashi (Fish Market) at Nihonbashi, c. 1910. “About the carved stone skirts of the Nihonbashi bridge clusters this place, odorful of the Sea God’s breath, which supplies the two million inhabitants of the Japanese capital with the fish that are daily brought by the lean brown sampans from near and far-off waters, the scent of seaweed from the deeps of the sea clinging to them like cerements. The Fish-market at Nihonbashi, Tokyo, c. 1910. “The huge square on the east bank of Nihonbashi bridge was filled with an enormous, bustling crowd of people. This was one of the largest wholesale markets in the city, and from sunrise until late in the evening it is thronged with people shopping, selling all sorts of seafood and other produce, or just out to watch the comings and goings of Edo’s citizens. “The town area around Nihonbashi was one of the first to be settled by townspeople after Tokugawa Ieyasu set up his capital [in Edo] in 1590. The Shogun built his castle on the nearby hill, and his daimyo and other retainers built their main estates on the many hills and plateaus nearby. The flat land of Nihonbashi, however, has always been the center of daily life for the common people, or shomin. Most of the people in the lower classes lived in very small houses. “The great square beside Nihonbashi bridge was even more important than other public squares in the city, because it was also located next to one of the biggest kashi (pier districts) in the city. Most ocean-going ships bringing goods to Edo unloaded their products onto smaller barges and takase-bune in one of the main ports, like Shiba or Tsukiji. Fruits were unloaded and sold to wholesalers in the Kanda pier district (Kanda no kashi), while cloth and clothing is taken to another kashi in Suruga-machi. 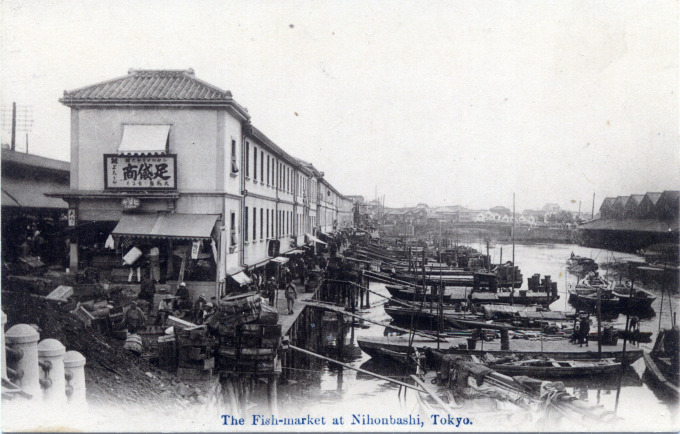 The Nihonbashi pier handled seafood, and the nearby public square became home to a vast fish market, the Uogashi, selling every type of seafood imaginable. Beside the bridge were the piers where fish were unloaded from barges and small boats. Several stone steps led down to the water’s edge, and strong men made their way up and down these terraces carrying large baskets of seafood from the boats to the wholesale shops in the square. 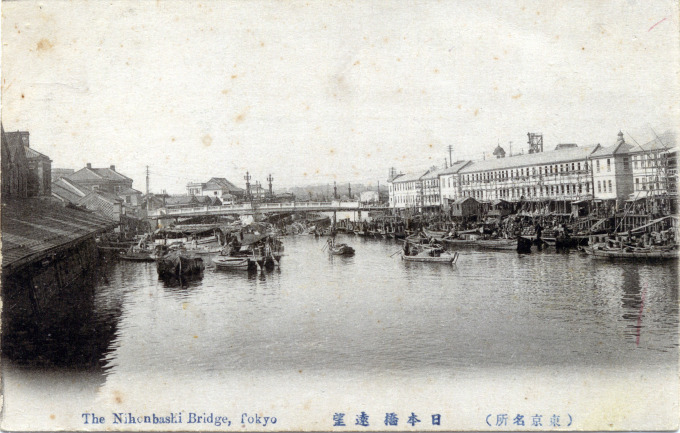 Nihonbashi Bridge, looking west past canal-side warehouses and fish markets, c. 1910. One member rises and starts scolding in a loud voice, gesticulating like a madman, (and upon asking what all this meant he was told that) they were in the middle of deliberations of national politics. Dressed in laborers’ clothes, the scolding, the appearance of the vice-president – it well resembles the fish market at Nihonbashi. Pingback: Tokyo'da yemek kültürü nasıl gelişti?